The month of March sees a transformation in Chicago as St. Patrick’s Day approaches. Shops become adorned in green four leaf clovers and other Irish memorabilia, and people crowd the Chicago River to watch it magically turn green. The annual Irish Film Festival is one of the many festivals during the month, an annual event since 1999. The festival, however, nearly didn’t take place this year after festival founder Jude Blackburn and its old sponsors dissolved their partnership. “We changed locations for the first time,” Blackburn said. “For many years we were in the southwest side in the Beverly community. There was a great deal of change there with the board of directors and administration. I had been there volunteering for almost 27 years. “In the end it was just one of those things where you knew the relationship was over. I said I can’t let this die, it’s in my soul it’s in blood. People were still sending me films all year. Thanks to a strong community of friends and associates, as well as AMC Theaters, the festival was moved downtown. Blackburn said the move was also beneficial in that it would broaden the festival’s audience. 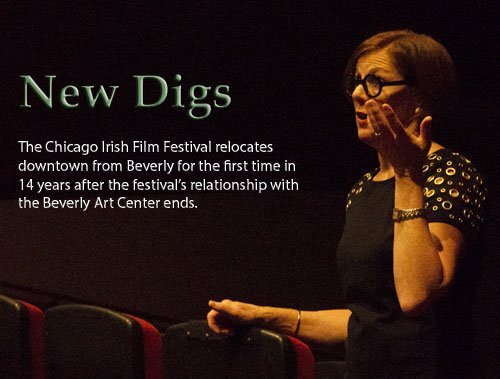 Two films played on opening night March 1, including the Sundance award-winning documentary short “Irish Folk Furniture” and the feature length drama “Sanctuary”. Sanctuary, a co-production between Ireland and Poland starred actors from both countries. About 150 film fans attended the event. They sat patiently until Blackburn made her way to the front of the theater, smiling. She gave a short and heartfelt introductory speech on the festival and just how much international appeal the films have. “It’s the 14th year of having the wonderful commitment and gracious sharing of Irish films by Irish film makers, films that are screened all over the world.” Blackburn said as the audience cheered and clapped. “How many times have people said to me ‘Who wants to see Irish films?’ and I look at them: they just want Sundance.” Blackburn said. “Tonight’s feature just came in yesterday from Glasgow, tomorrow’s feature ‘Earthbound” just came down from Toronto. Two are going off to Berlin. One was just in Rome at the ‘Roma Festa of Ireland’. 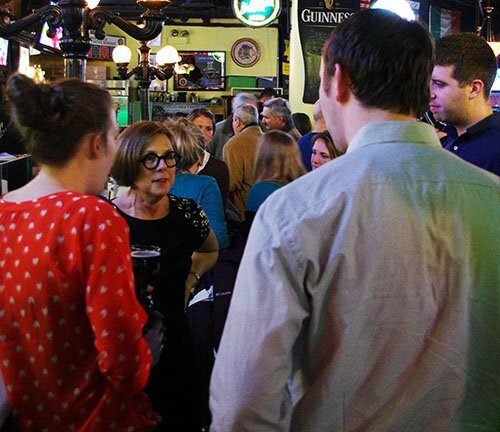 After the films screened, audience members were invited by the festival organizers to attend a reception at Lizzie McNeill’s, a nearby Irish bar. Blackburn joked she would explain audience members why half the film had been in Polish. The bar featured a live band playing traditional Irish music. As a token of appreciation the bar’s owner rewarded film goers with a single free beer with proof of attendance by ticket stub. Blackburn explained the importance of film festivals mentioning how the screened films have the power to bring people together. “I think film is brilliant and I’m very sad to think of people watching them on their cell phones, even their laptops,” Blackburn said. “It doesn’t belong there, film is a brilliant medium for bringing people together and having a shared experience and seeing the world. According to festival board member Carol Lett, the festival’s earliest shows took a great deal of time and patience to organize. Time zone differences, technology, as well as miscommunication were some of the hurdles Blackburn had to overcome to get the festival organized. Blackburn would be up late at night calling or faxing people overseas trying to make the festival happen. Blackburn also spoke about that how the first festival could not have had better timing. The Irish film industry was witnessing a rebirth in the late 90s. 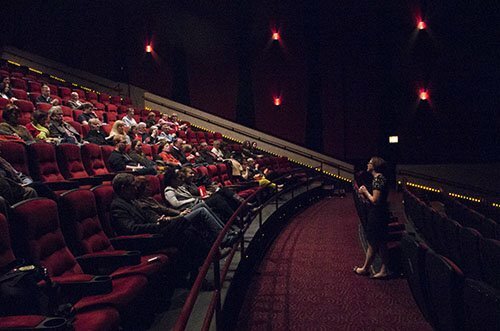 A large group of Polish Chicagoans had also attended the film screening and were sitting together at a table discussing the movie. Elizabeth Aughnessy was another viewer who had also attended the festival’s opening night. As moviegoers left the bar, many stopped to thank Blackburn and say goodnight. The festival’s first downtown event was over. Blackburn wore a perpetual smile. “I was watching the president today and I felt so sorry for the man because if someone told that group of reporters that Kim Kardashian was in the back room they would all have gotten up and left, and they’re all on their cell phones. I mean how many times can you hashtag ‘president’?